Forces for Change, a Wales-wide 2017 campaign, will be officially launched by Minister for Social Services and Public Health Rebecca Evans AM at an event in the Norwegian Church, Cardiff Bay on 11th May 2017. The campaign will see armed and blue light veterans reaching out to fellow veterans who are experiencing mental health problems. Their goal: to support them to access the services they need to recover – and to hear their ideas about how those services can be improved. The launch will be followed by events covering the 22 counties of Wales throughout the summer where veterans and their families will be provided with information about what support is available – from both mental health and veterans’ organisations – and how they can access that support. 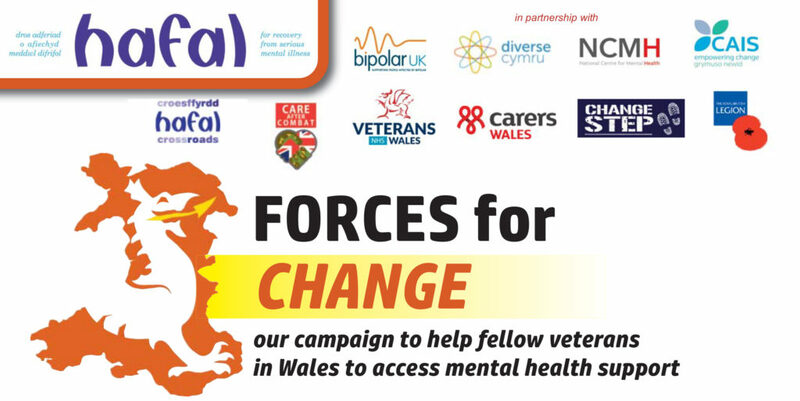 The veteran-led campaign is supported by Welsh mental health charity Hafal in partnership with Bipolar UK, Diverse Cymru, CAIS, Care after Combat, Veterans NHS Wales, Carers Wales, Change Step, The Royal British Legion, the National Centre for Mental Health and Hafal Crossroads. Minister for Social Services and Public Health Rebecca Evans, who has specific responsibility for Armed Forces and veterans’ health issues, said: “We owe our veterans a huge debt of gratitude for their service. That is why we are committed to ensuring the appropriate care and support is available to those who need it. Rebekah Burns, a member of the Panel leading the campaign who grew up on various military bases and later became a military wife, and who has experienced PTSD, said: “The aim of our campaign is to connect with our fellow veterans and their families across Wales who may be trying to cope in silence, and to signpost them to the veterans services and mental health services who can help. Panel member Frank Kitt, a former police officer with experience of anxiety and depression, said: “A career in the armed and blue light services can be hugely rewarding as well as providing vital support for the security, safety, and health of all of us. But as in any organisation, some people will experience mental health problems. Sometimes these problems arise from the work; sometimes they will arise from other causes. Royal British Legion Manager for Wales Anthony Metcalfe, who served for 12 years in the 1st Royal Tank Regiment, said: “We are proud to be supporting this campaign. While the majority of armed forces veterans transition well into civilian life, for some this can be problematic, and while the support services are in place, we need to ensure that we remove the stigma and barriers that prevent some from accessing the help that they need. The Forces for Change launch event begins at 10:00am, and Rebecca Evans AM will formally launch the campaign at 10:30am. A light lunch will be available from 12:00 midday.